“What a piece of junk!! !” Luke Skywalker. With that line we were introduced to a spaceship whose form was not based on a sleek rocket or animal but rather a hamburger and an olive. 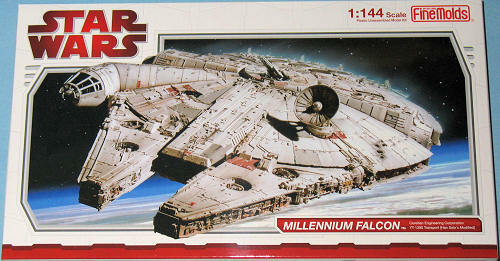 The Millennium Falcon was Han Solo’s main ride in the Good Star Wars Trilogy. It was the fastest ship in the series (12 parsecs?) and could get out of many situations including being trapped by Imperial Cruisers orbiting Tatooine (by drifting slowly to the left/right) or weaving in and out of the rather cramped interior of the Death Star, but not when stuck in an asteroid belt near Hoth. It was based on the standard YT-1300 Freighter which according to Star Wars lore was in my opinion the Honda Civic of the Star Wars Universe as it was a simple design that allowed for extensive modifications by the owner. According to the expanded Star Wars universe, the Falcon passed through several hands and name changes before Lando Calrissian won it in a Sabbac game (Star Wars poker???). After Han Solo won it in a Sabbacc (naturally) tournament from Lando, the freighter received extensive modifications to its equipment including powerful shields, jammers, engines and weapons to become the ship we see in the Star Wars Trilogy. Han used it as a small time smuggling ship to get people and things that Imperial customs shouldn’t know about. It was during this time frame that he ran a foul of Crime Lord Jabba the Hutt by dumping Jabba’s illegal cargo of spice just as he was about to be boarded by Imperial Warships or customs vessels. He was temporarily saved from Jabba’s wrath by an even more desperate Obi Wan Kenobi and whiney youth Luke Skywalker who walked to get to Alderaan system. Funny tidbit, the original Falcon looked more like one of Space 1999’s Eagles till someone pointed out the similarity between the two vehicles. The original design was then modified into the blockade runner that was shown in the opening scene. 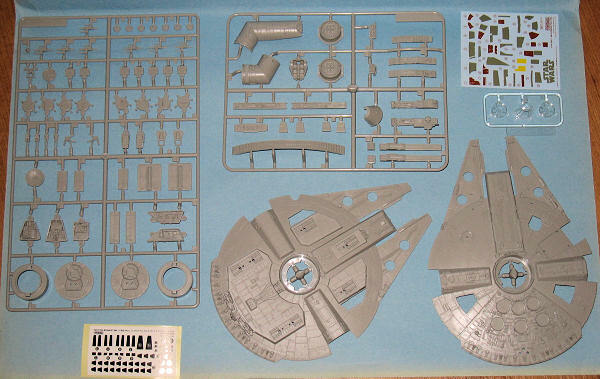 Fine Molds first came out with their 1/72 scale version of the Millennium Falcon. It’s incredible detail, size and almost $300 price tag blew the minds of SF modelers including the reviewer who was tempted to purchase this kit until he was reminded about the state of his bank account at the time. Instead Fine Molds has gone to a more manageable 1/144 scale Falcon with a much fewer parts count that the 800-1000 of the 1/72 version and about four to five times cheaper than the original 1/72 kit. The Fine Molds 1/144 kit consists of five sprues of light grey plastic consisting of 89 parts (including a four piece stand), one sprue of clear plastic containing three parts, a decal sheet, detailed instructions, a color/decal placement guide and cut out masks. Among the parts include ones for a 1/144 scale cockpit. The parts have very fine detail for the scale and are almost flash free while the clear bits are very clear with little distortion. It is expensive for a 1/144 scale kit, but then again not many 1/144 scale kits comes with the level of detail that comes with this kit.